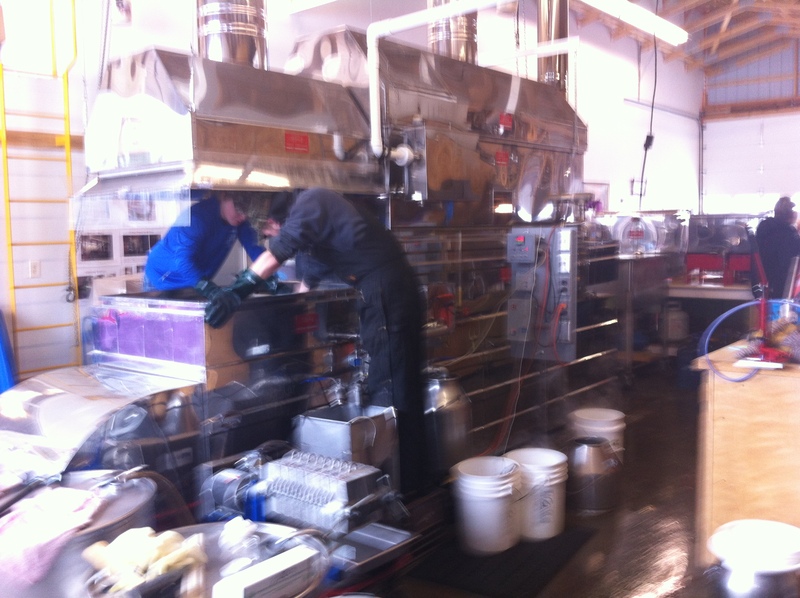 This past weekend we got a lot done. The living room was patch painted and furniture moved in. The nursery was mopped, we bought shelving for the closets, and furniture moved in as well. In addition this, we did a tour of the family birth center at the hospital and test drove a car we are looking at buying. More pics and information on all of that to come. 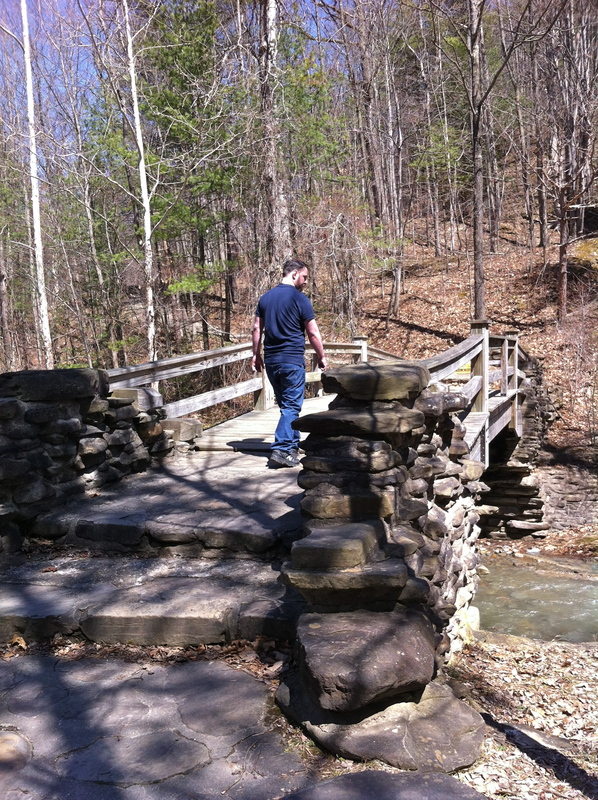 But in the middle of this very busy weekend we were able to have a moment of fun and exploration. We drive the same route every week to our birth class in Northern Olympia. So I decided to look on google maps to see what food options were close to where our class meets. I discovered there are interesting looking restaurants and stores along 4th and State running east of our normal northern route via Plum st.
We were running low on time, but we knew there were food trucks parked on the corner of 4th and Plum. It was a beautiful sunny spring day with a little wind blowing off the bays. We walked up to the parking lot where the food trucks are set up in a circle around wood picnic benches and a planter box. 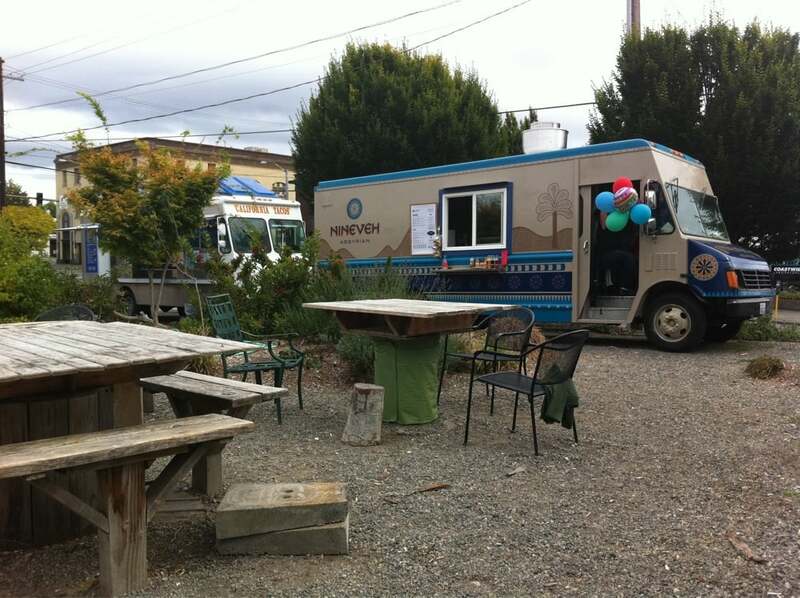 There four food trucks were parked featuring Middle Eastern, Venezuelan, Indian fusion, a traditional taco truck. 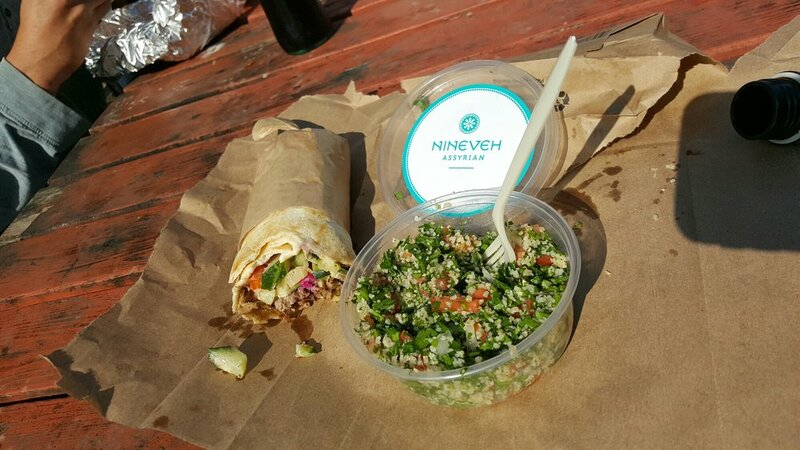 Since we were exploring, Luke decided to order a lamb/beef shawarma from Nineveh , the Assyrian food truck, and side order of bourek. 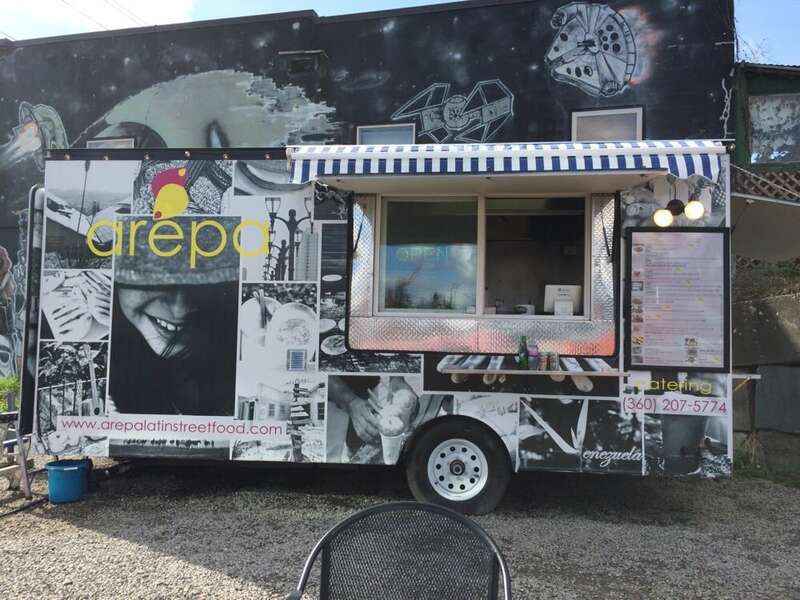 I went to the Venezuelan truck, called AREPA: latin street food, and ordered the carne arepa with a side of yuca fries. To drink we went to the California Tacos truck for glass bottled Jarritos and Coke. 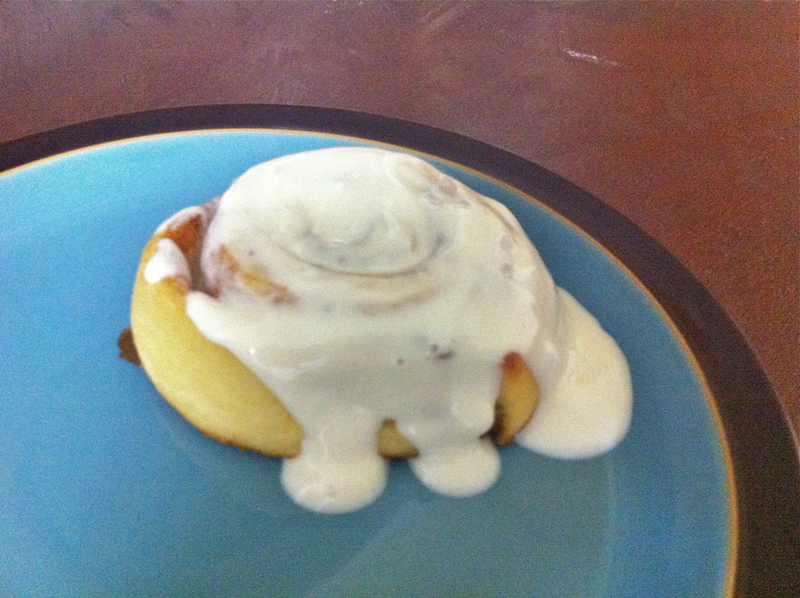 The food was very flavorful, and great portions for the cost. Luke really enjoyed his shawarma and after a bite I’m looking forward to trying their falalfel shawarma. The bourek was something new to me, an egg roll on the outside with middle eastern spiced ground beef/lamb and spinach on the inside, very tasty. My arepa was great, another first for me, the bun is made of corn so it’s gluten free! (yay) and the shredded beef was savory. The yuca fries were great too, and even better when dipped in the cilantro/avocado dressing they came with. In all, although slightly rushed, it was a fun discovery with great food and a wonderful mini date in the midst of a busy weekend. 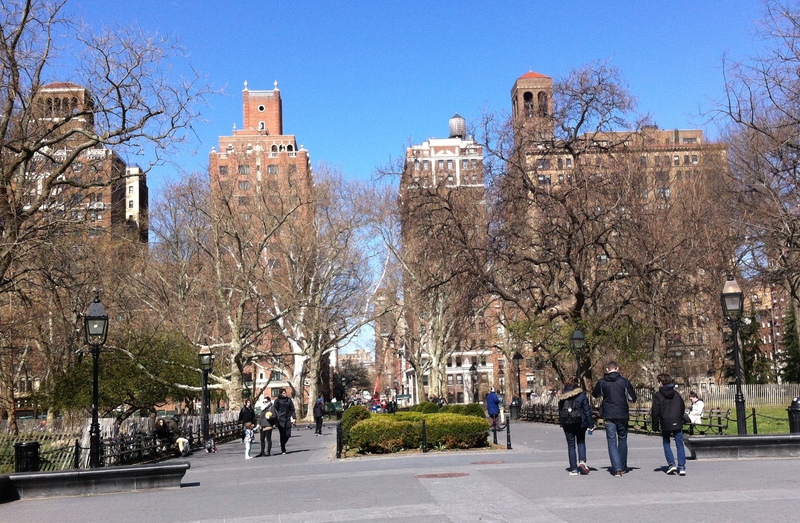 The next day, we decided on a later start and took the subway over to Greenwich Village. 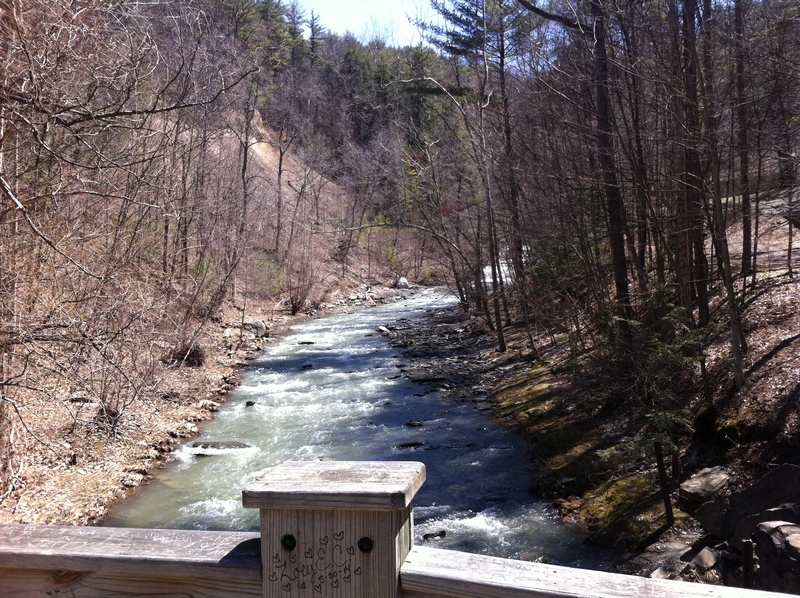 It was a sunny cool spring day with a little wind, unlike the rainy day before. 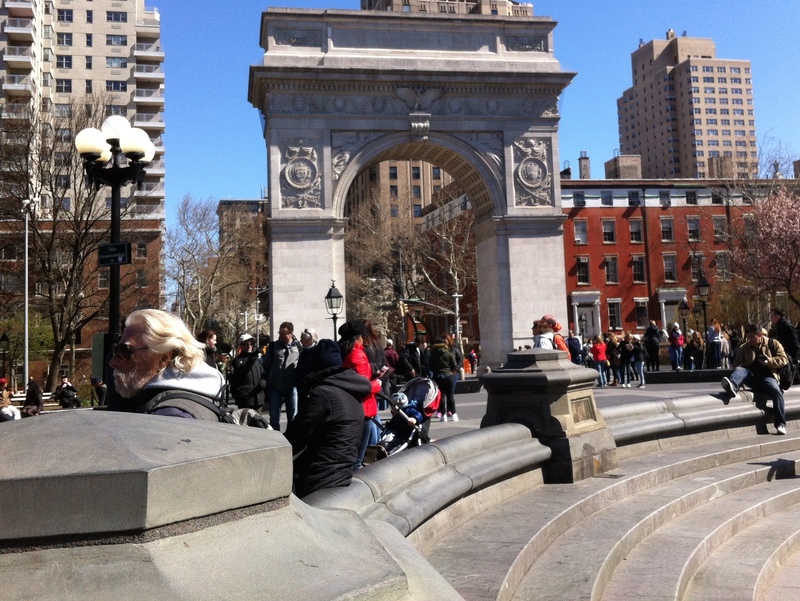 We walked over to Washington Square Park to see the Washington Arch the park view was amazing. 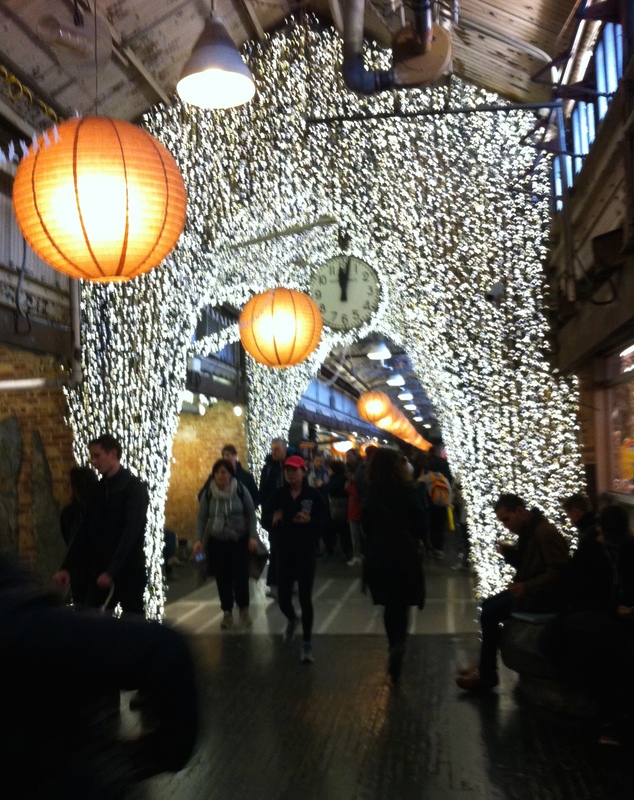 We sat there for awhile just taking it in and people watching. Then we walked through Greenwich village, a neighborhood full of small artisanal stores, markets, restaurants, churches, gardens, and parks. 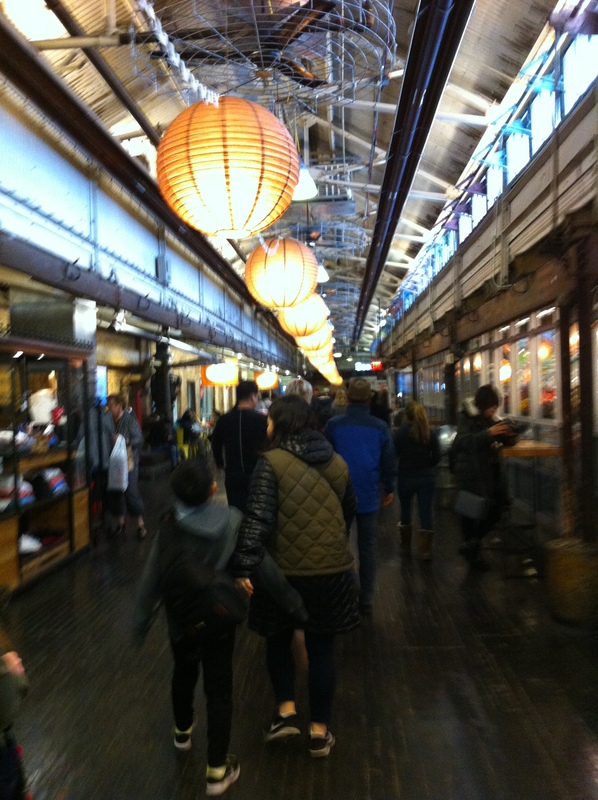 After an enjoyable mid-morning walk we found our way to Chelsea Market. As an avid food network and travel channel watcher, this was a major destination. Even though it was a Tuesday afternoon, the place was packed with locals getting lunch. 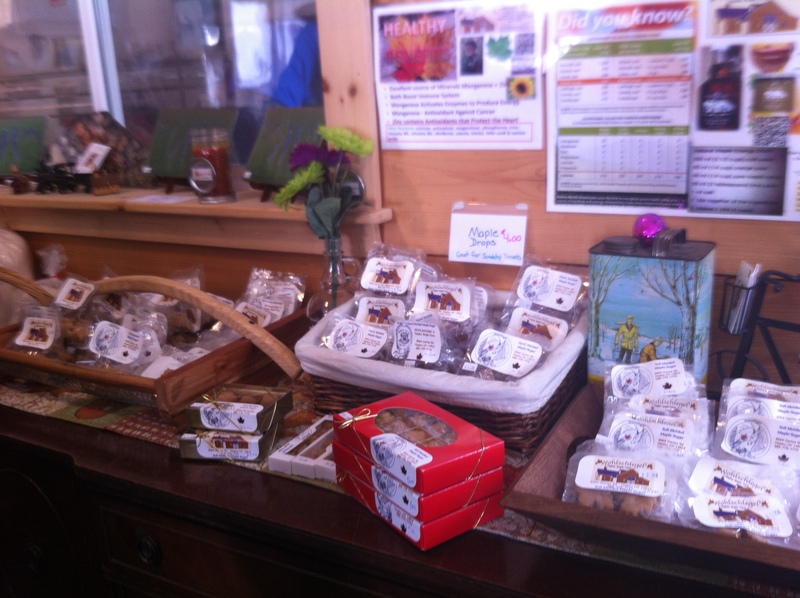 We first walked to Lucy’s Whey a small artisans cheese shop where we ended up buying two blue cheese, wedges including one made of goat milk, and one creamy goat milk wedge with black truffles in it. After exploring, we ended up getting in the very long line for Los Tacos No 1. The place everyone says to go for tacos. I got one pork carnitas and one carne asada taco both with everything on them and shared an Horchata with Luke. With minimal seating, many people were sitting on steps or leaning against a wall to eat. 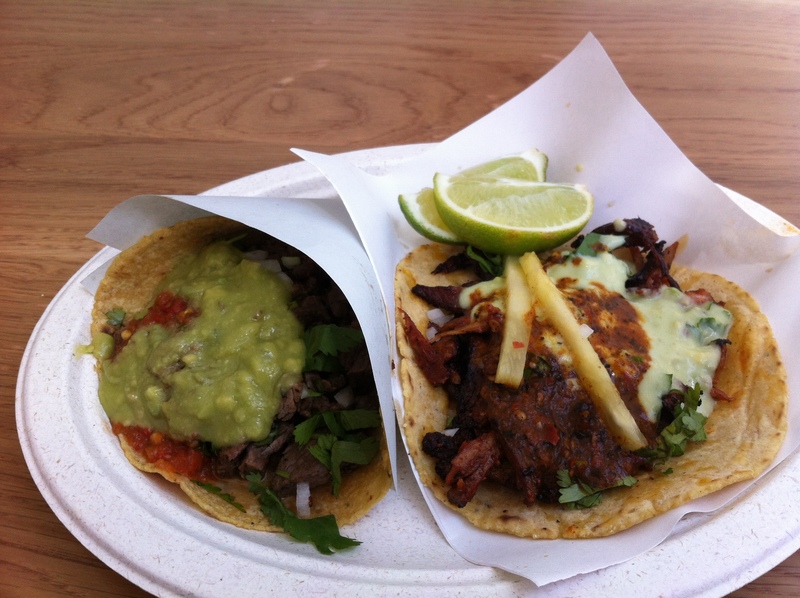 We were luck to find a small standing table at one corner of the market to enjoyed our street tacos. I know everyone swears they are the best, for me they were the best I’ve had in New York state, but I would say the were on par with most of what I’ve had in SoCal. To finish are afternoon snack-age we then walked a few blocks over to Artichoke’s Pizza where you can get a slice for 7 bucks. Although that may seem steep, these pieces of pizza were big enough to share, we order one slice of their classic artichoke alfredo and spinach pizza, they heated it up for us and sliced it in two; it was wonderful. 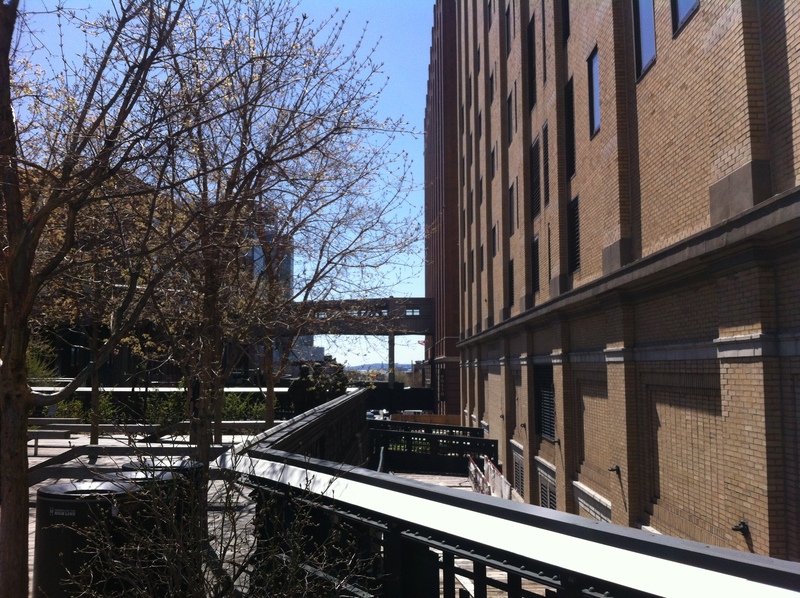 We took our second lunch up a set a stairs and onto the the High-line. 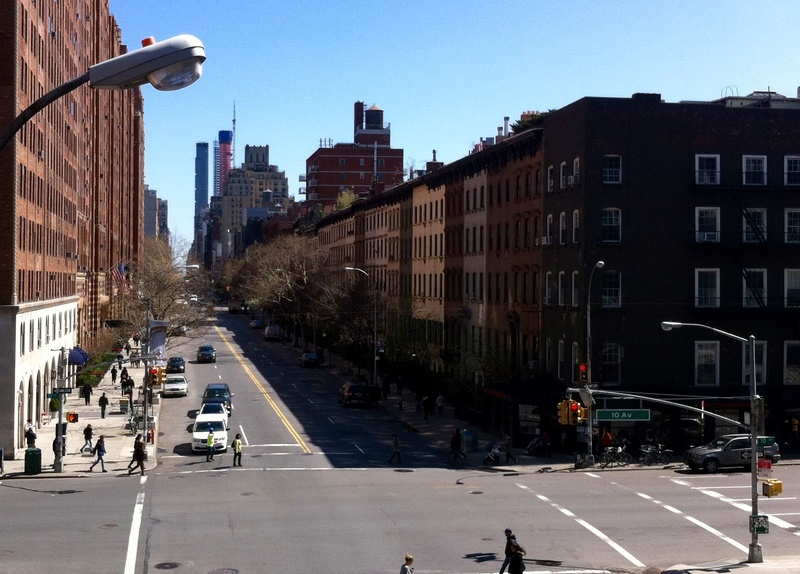 The High-line was once a old rail line that has been changed into an outdoor walking park that covers most of Greenwich Village paralleling the water. 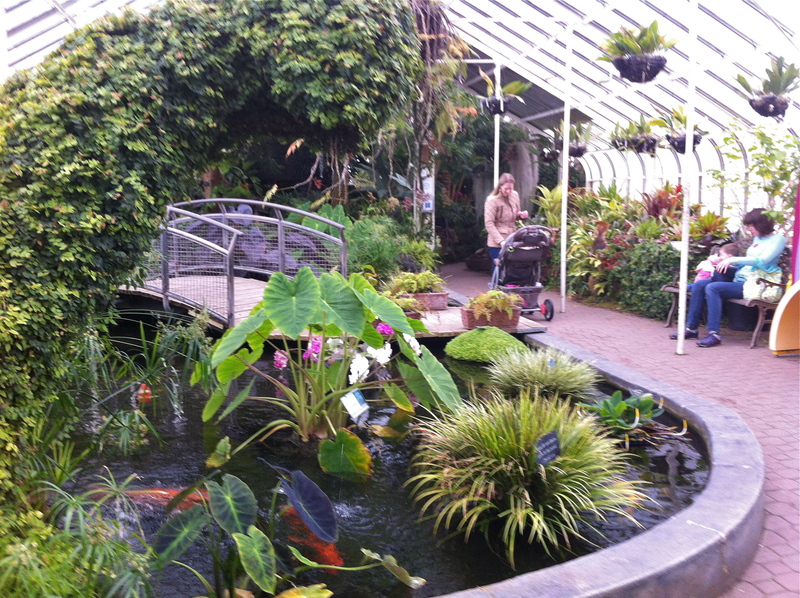 In-spite of the crowd, we still found a semi- quiet spot to rest and eat. 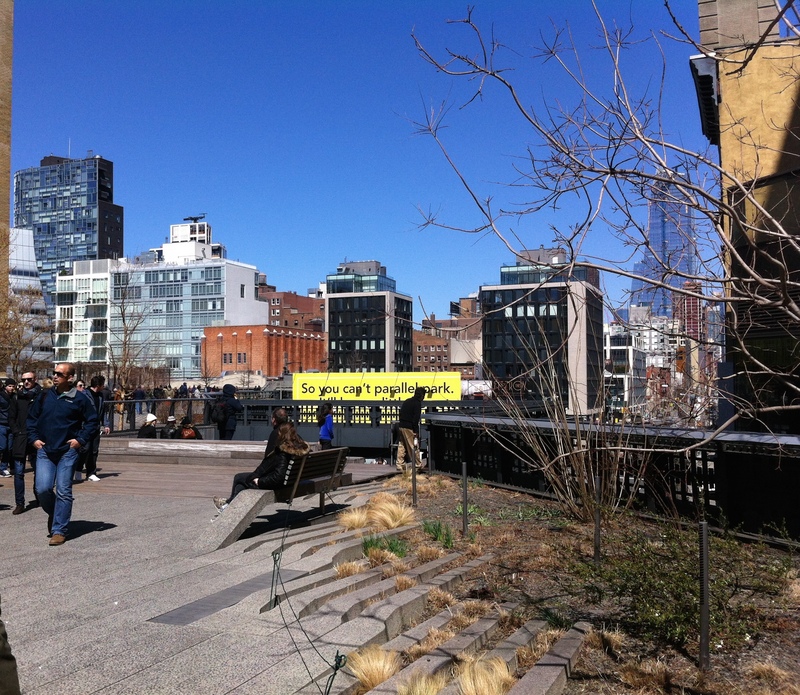 Then to work off our double lunch, we walked a good portion of the Highline, which provides a great view of the city. It was a clear day and we could see blocks away: the cherry trees just beginning to blossom against the brick apartments and iron fire-scapes of the neighborhood. It was a beautiful afternoon. This year spring is coming early, very early compared to last year. So this past weekend we started to prepare the hill and garden. Luke used the tiller to till up the ground and add a few more rows to our garden. 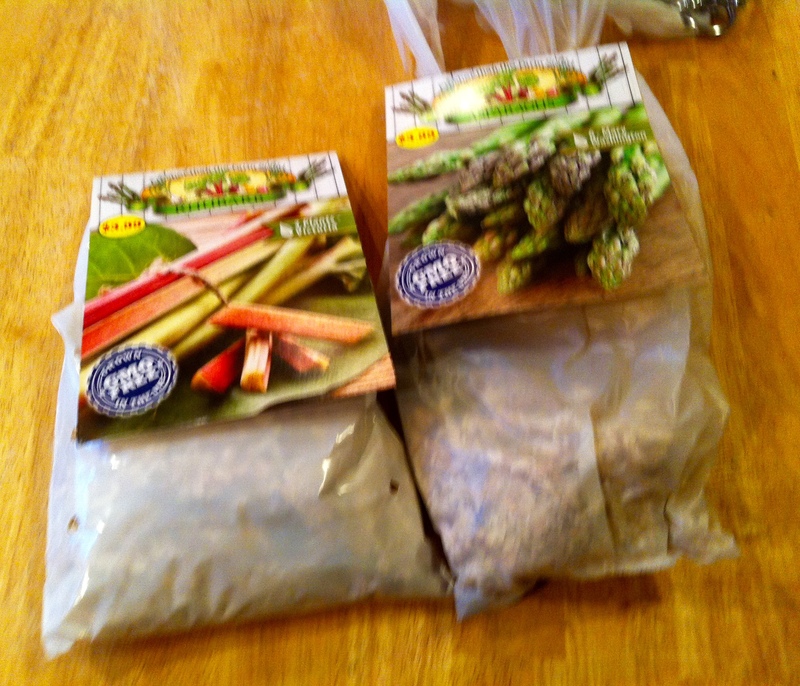 We went to the store and bought on organic seeds for this spring/summer including: carrots, spinach, broccoli, zucchini, asparagus, and rhubarb. 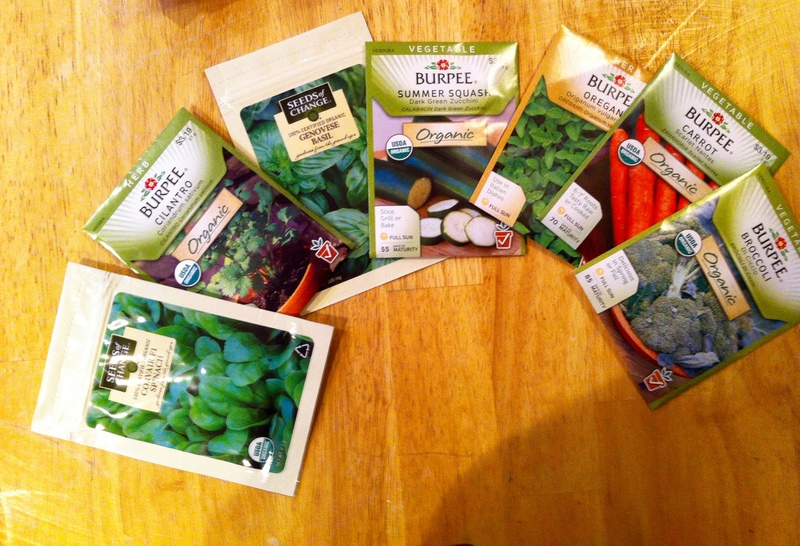 We also bought herbs: oregano, basil, and cilantro to add to the garden this year. I climbed up and down our hill collecting broken branches that fell of trees the winter wind and collected them into the burn pile. 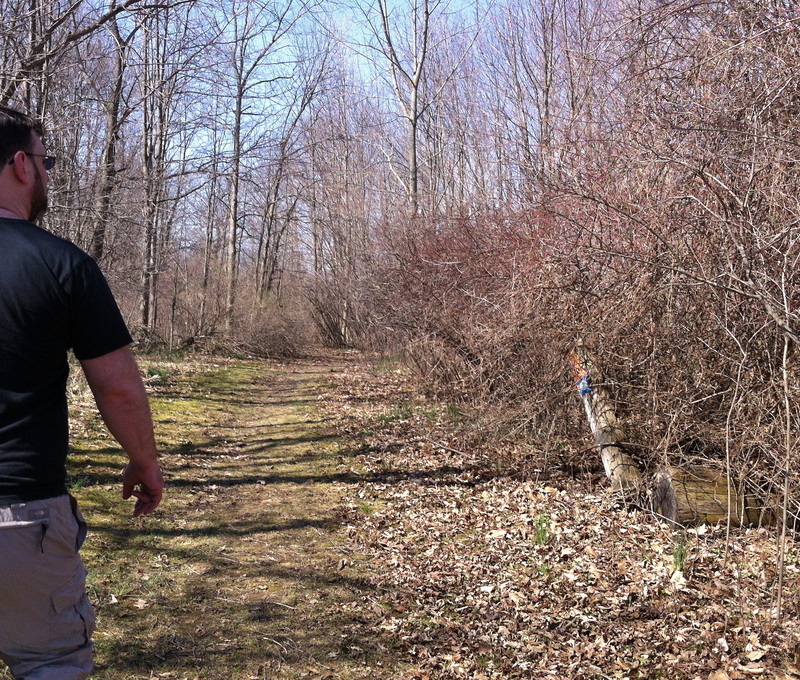 We also marked trees and branches that needed to be cut down and Luke cut them down with his chain saw. More work still needs to be done but it is very exciting to have a Sunday Saturday in March to work outside. On Sunday we got sushi at our favorite place in Rochester to celebrate Luke’s birthday he also spent some bday money in the game and comic store next door. 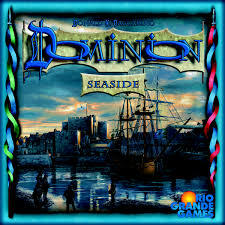 When we got home we played our newly bought game: Dominion Seaside expansion. On his actually birthday we celebrated with his favorite birthday meal, beef stroganoff and my homemade Irish cinnamon rolls. Yes, I am still writing posts at the end of April to catch up to March but this is the last one, I promise. 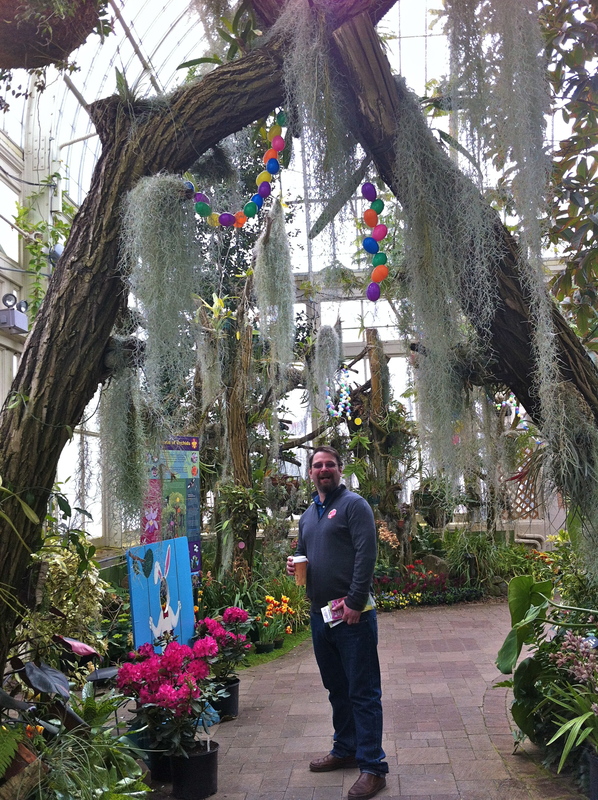 During our mini spring-break trip to Buffalo we also went to the Buffalo Botanical Gardens. 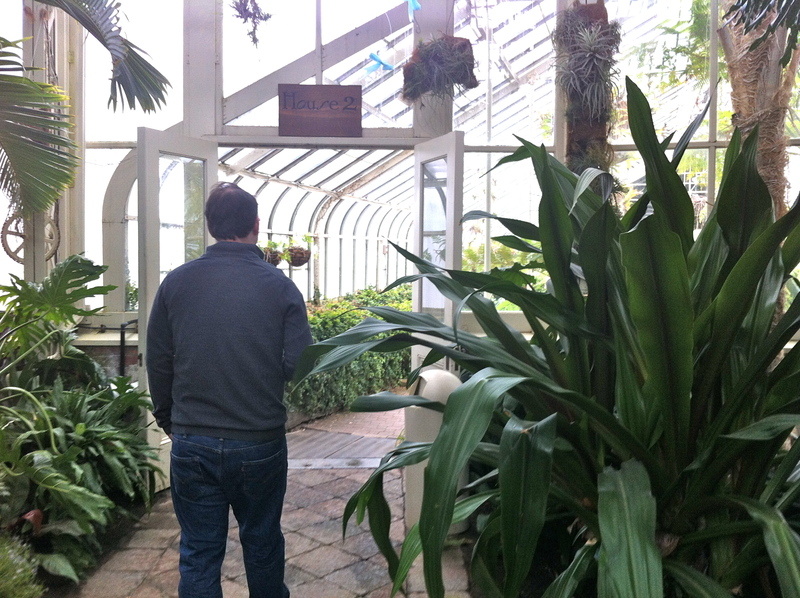 Luke at first seemed uneasy about going until I explained to him that it was a giant greenhouse; almost completely inside. Then he was all for it. The wind was blowing hard as we went to the main entrance. 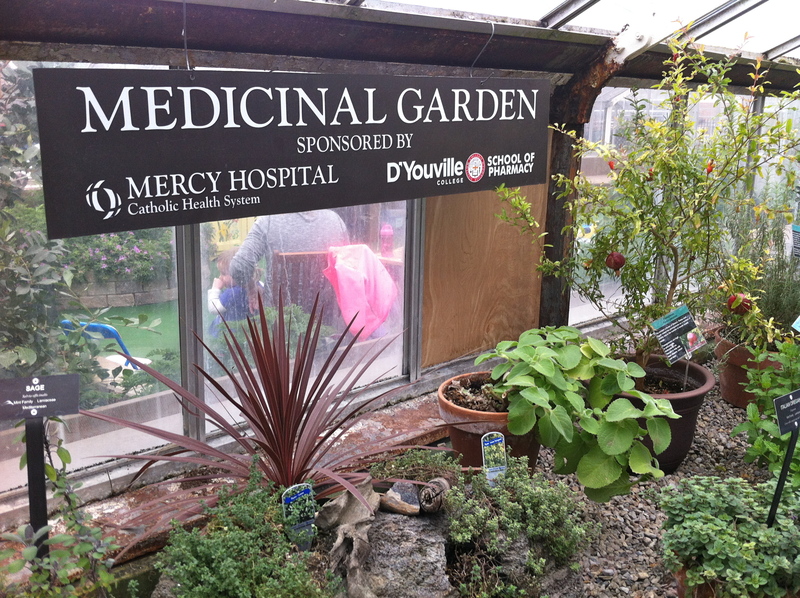 Once we got inside we were able to take off our jackets and breath deep the fragrant air of many plants and trees inside the greenhouses. 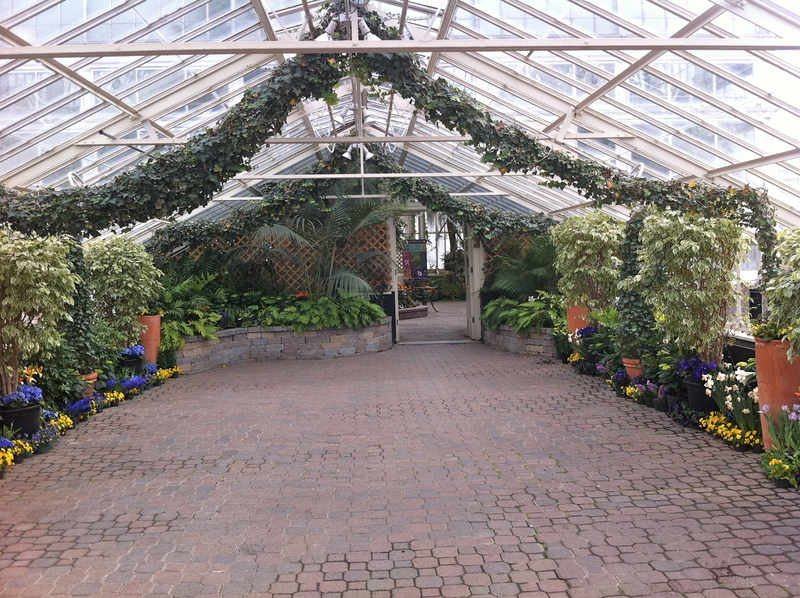 The Botanical Gardens has many different rooms each focused on different types of plants and their locations. 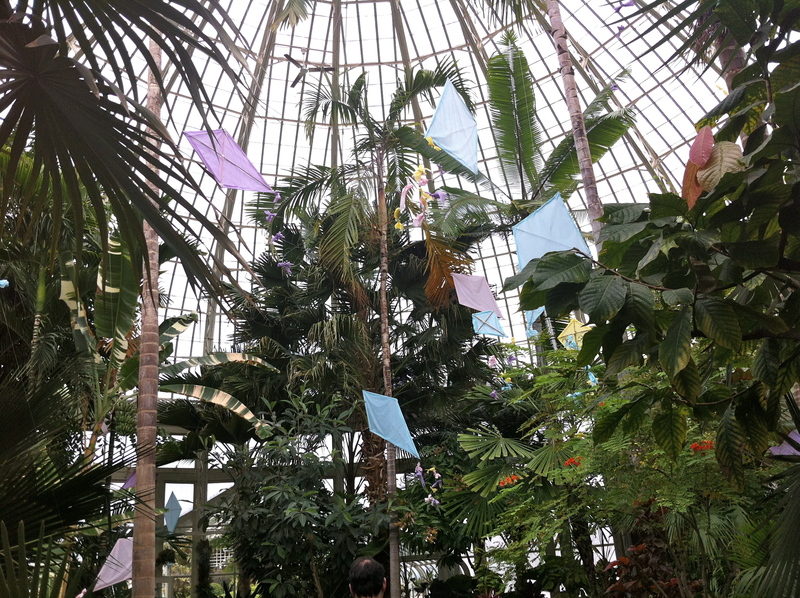 We first stepped into the tall atrium called the Palm Dome. It was the first time Luke had seen palm trees since leaving California. 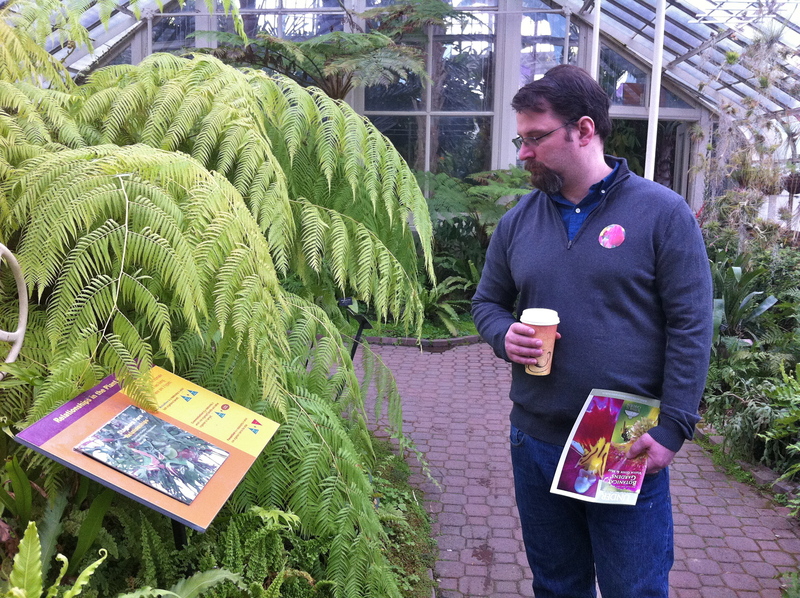 Then we went through the fern collection (we see plenty of those where we live) and onto the topiaries and coy pond. 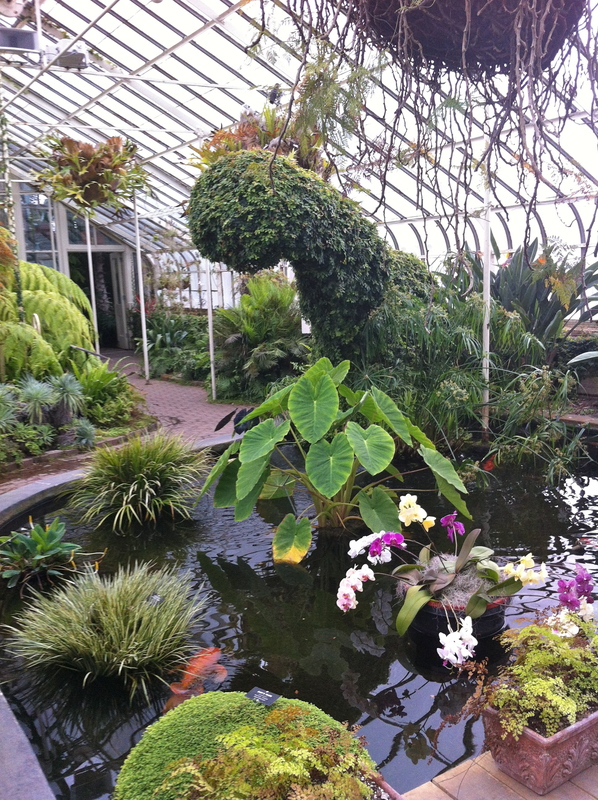 Here all topiaries are shaped to look like dinosaurs. We went over the pond bridge and found a great place to sit and drink our coffee while watching the waterfall covered in purple flowers and moss. 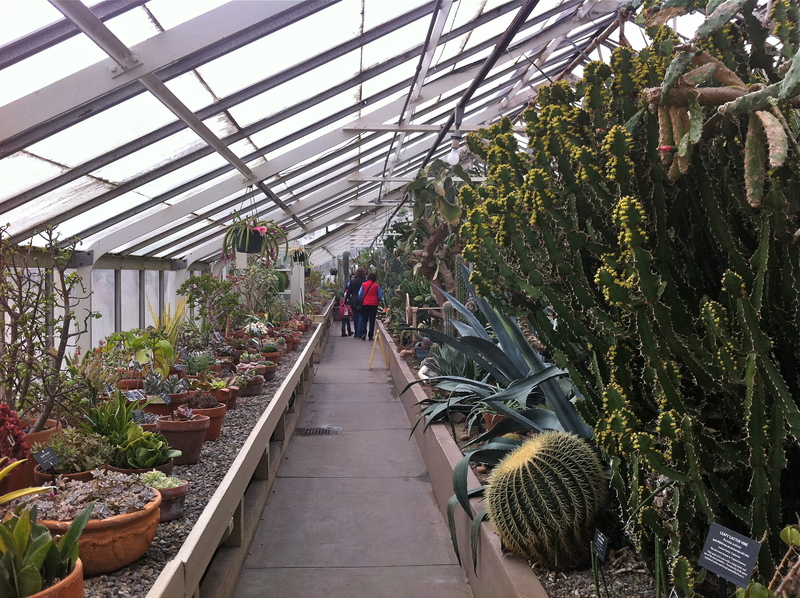 After sitting for a while we move onto the much warmer dessert room filled with cacti and succulents. Although I am much more familiar with these plants ( my dad/brother had a cactus garden in my backyard growing up) I was impressed to the variety they had in their garden. 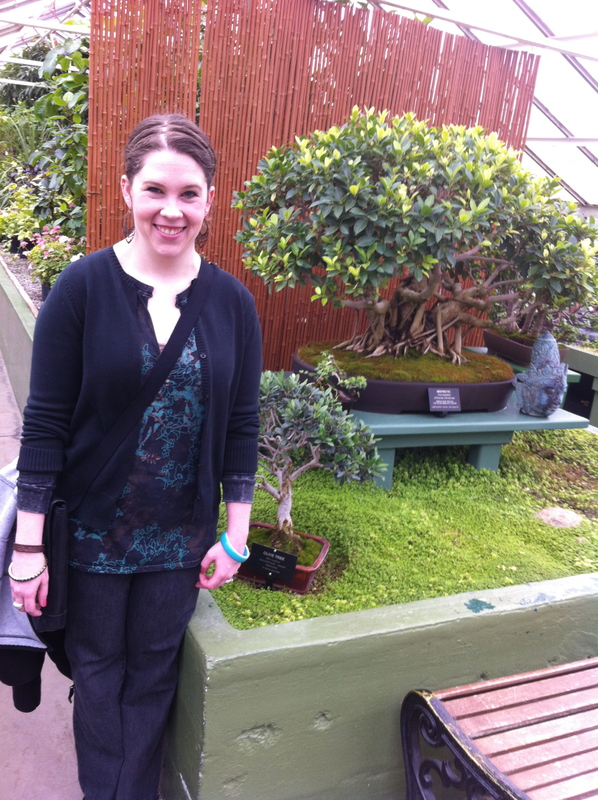 We probably spent the most time in the next room which housed several plant collections including the largest ivy collection in the world, a substantial bonsai collection and medicinal herbs/plants. 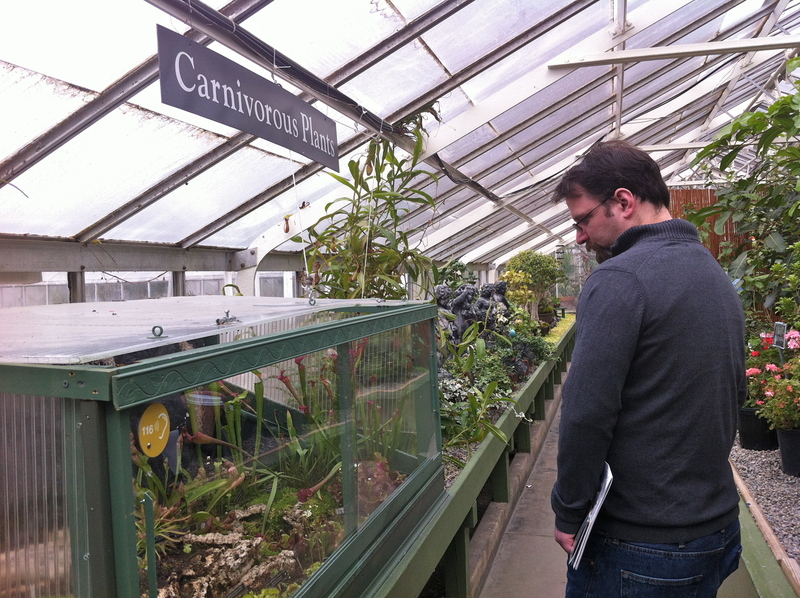 Luke enjoyed the boxed-in exhibit of carnivorous plants as well. 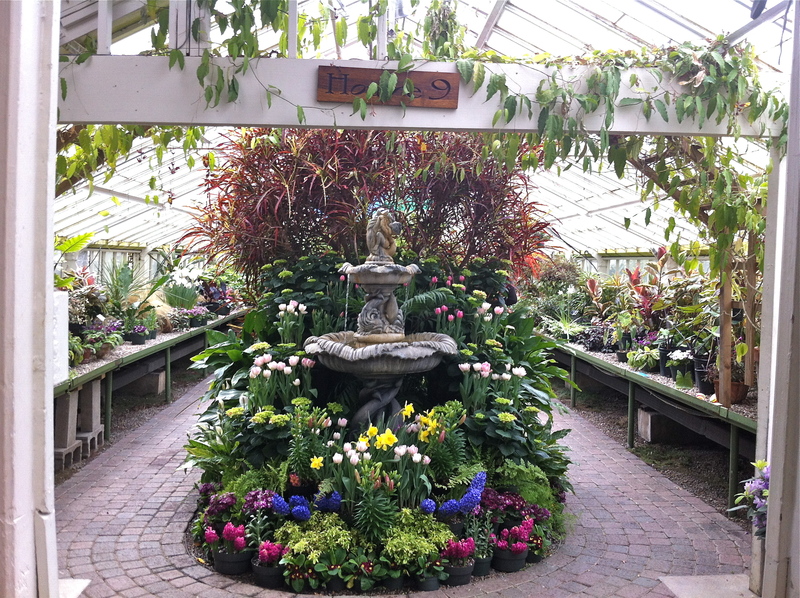 The next room: Archangel Room housed the brightest of spring flowers: roses, tulips, sweet broom and more. 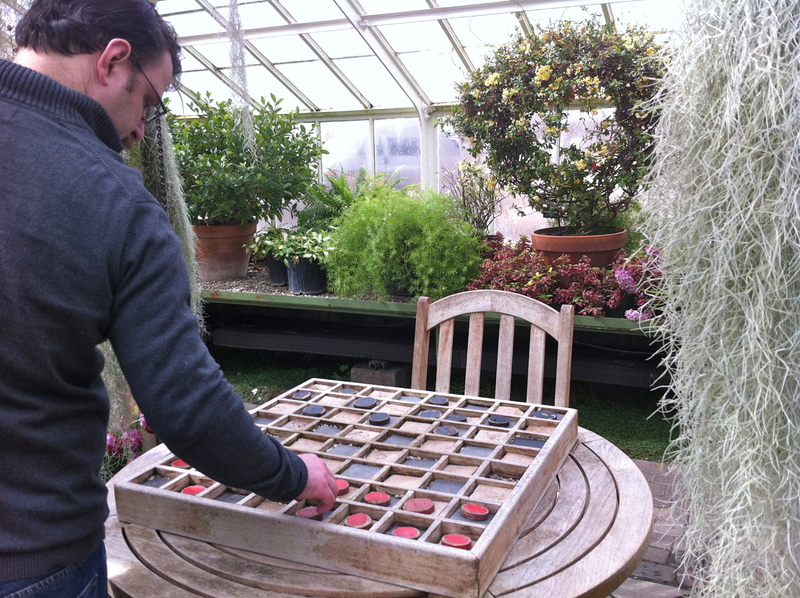 Here they had a water fountain in view of a ivy wrapped sitting bench, and a table to play checkers at. 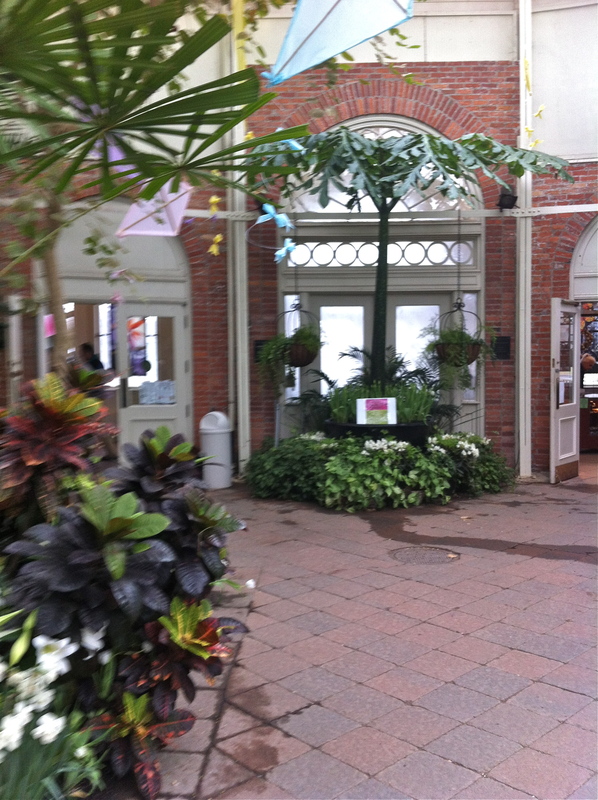 The room was decorated for spring including kites flying above and plastic easter eggs strung across the room. 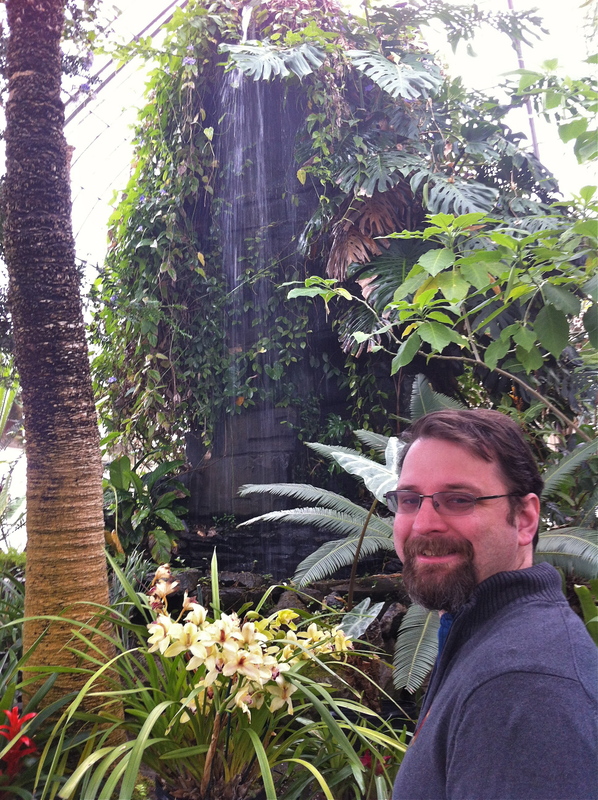 As we continued to wind around we saw one of my favorite new editions to the gardens: an orchid house. After that room we thought we were almost done exploring; surprised by how detailed each room was. But we still had yet to pass through house 10 where they hold indoor events/weddings, their Panama cloud forest, and Florida Everglades. By the time we were done exploring the gardens we had finished our coffee, warmed up from the cold wind, and relaxed taking in the peaceful gardens. 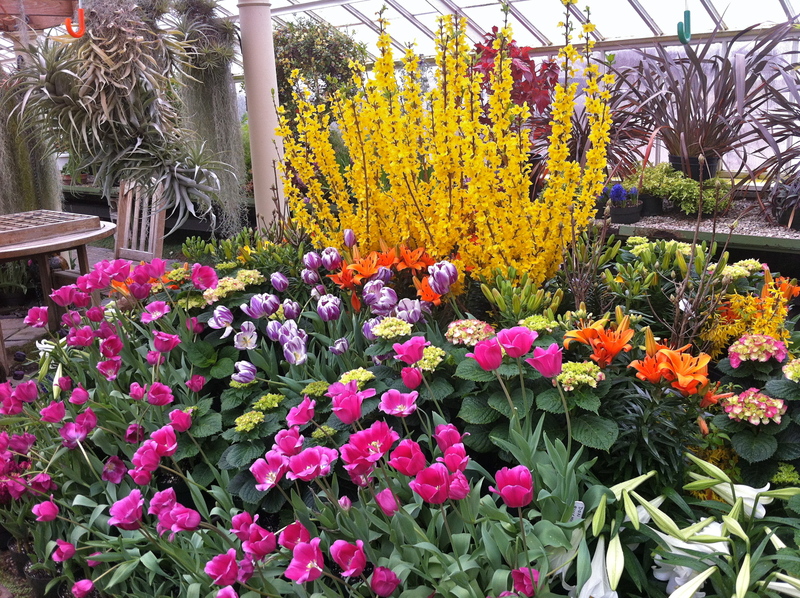 I know it’s April but as I wrote before I”m trying to catch up on our March events. When we moved to our house in October. 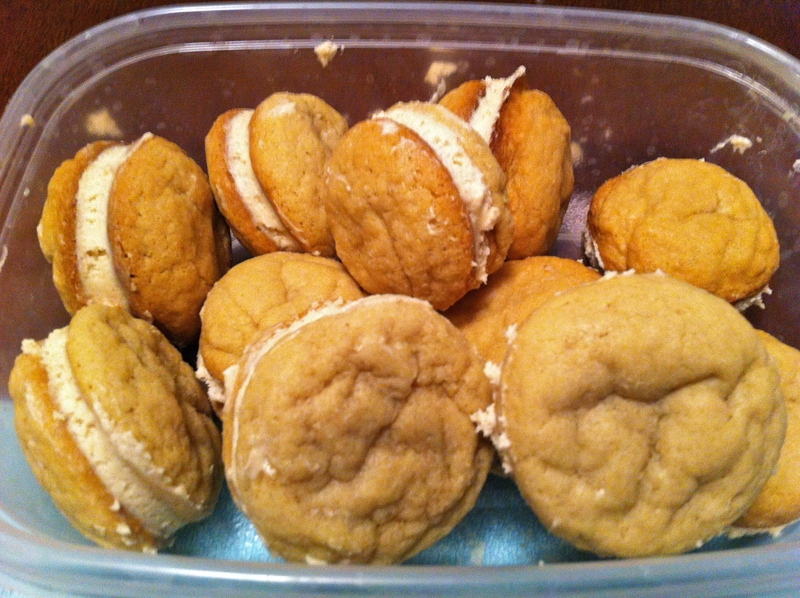 For more see https://agreenesadventures.wordpress.com/2014/11/26/im-back/. My sister in law Stina who was helping us move said she thought most of the trees behind our house were maple. By the time we moved their bright yellow leaves covered the ground. 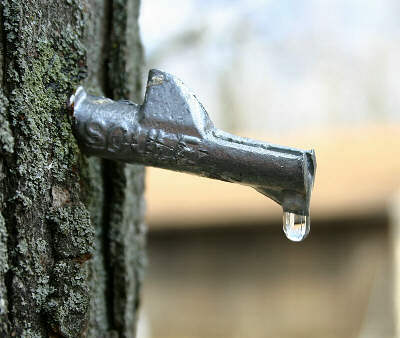 We had seen signs along roads with a tree tapped with a bucket next to it and been to farmers markets were local maple syrup was sold.But we had never toured a local maple syrup farm, until this past March. 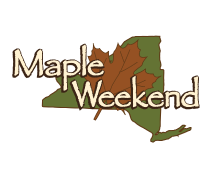 All across Upstate New York during March or April is a Maple Weekend. 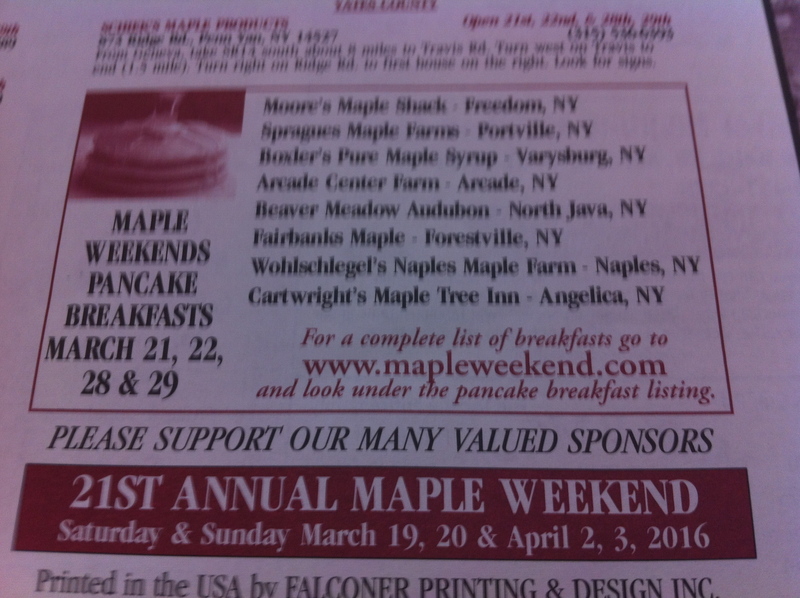 For more see http://www.nysmaple.com/nys-maple-weekend/ when local maple syrup producers open up their doors for tours of their facilities, hikes through their maple trees, children events, sales on their maple products and pancake breakfasts served with their maple syrup. 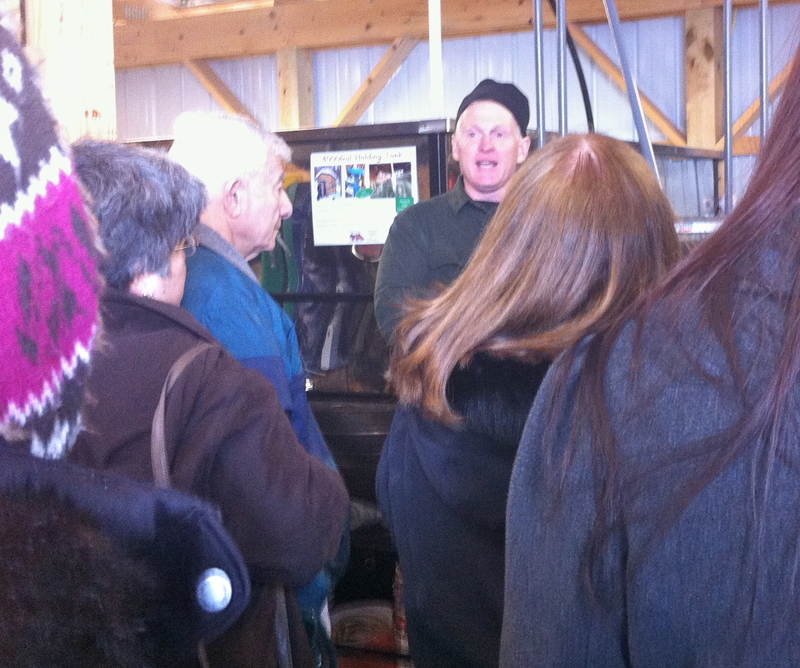 By the time we got to the sugaring facility they had opened up the back end of their syrup/sugar processing building and filed it with tables and chairs for a pancake breakfast. 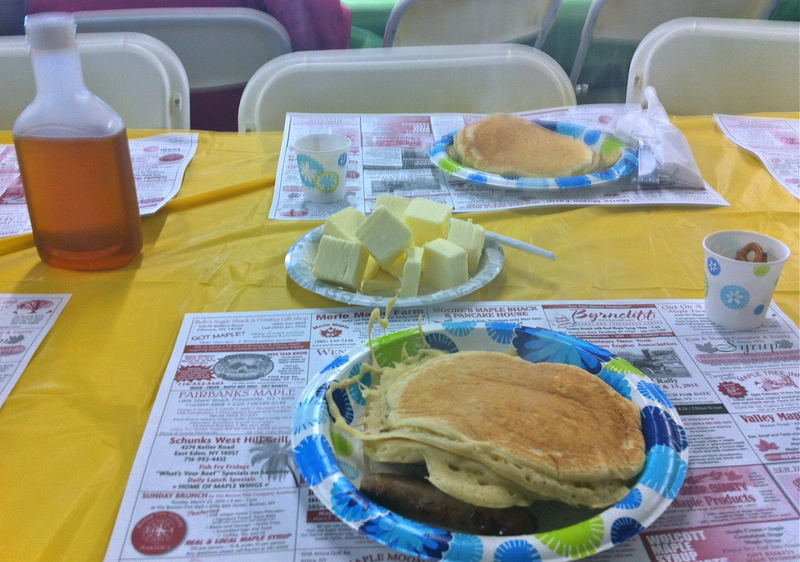 We payed a small prices for all you can eat pancakes and were given generous portions of pancakes and sausage. 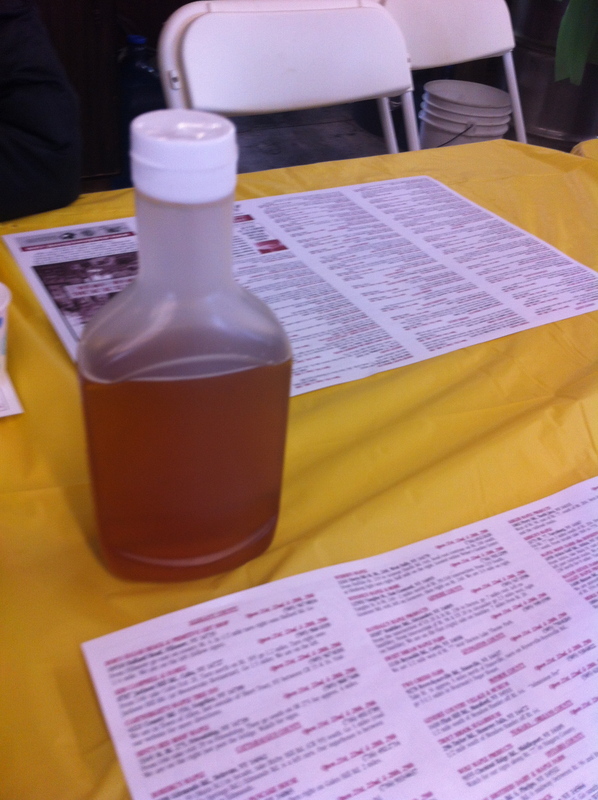 We got coffee (they had maple flavored coffee as well) and enjoyed looking around and at the menu which advertised all the local maple weekend events in the area. 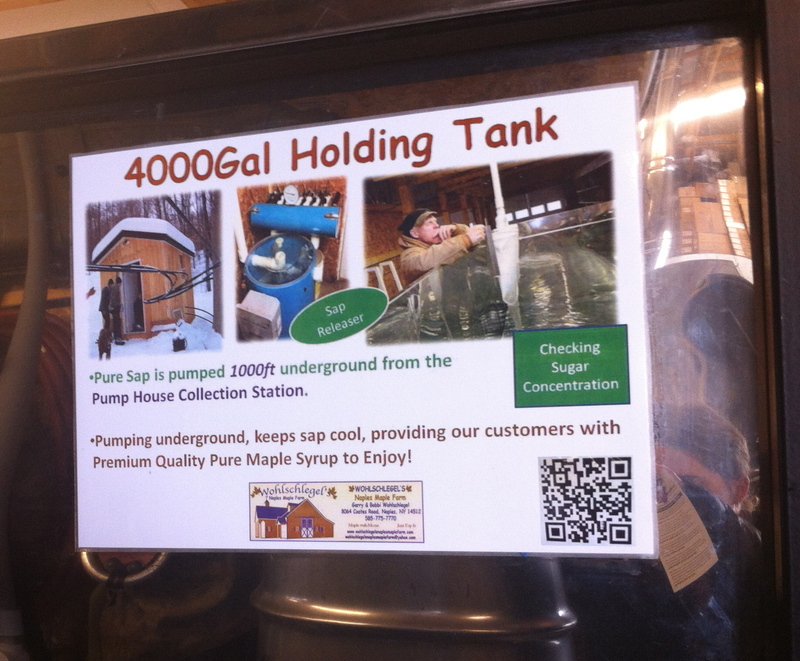 After breakfast we sampled some of their products: maple mustard, syrup, creams and enjoyed an indoor tour on how they process sap and turn it into syrup. 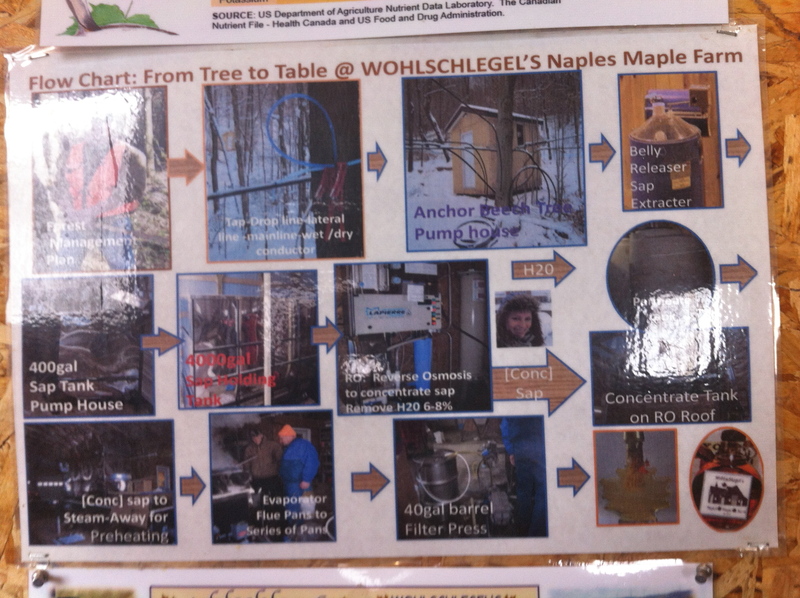 Luke enjoyed the chemistry lesson and told me later that from what he heard much of the new technology for processing the sap to syrup adapted from the brewing process for beer. 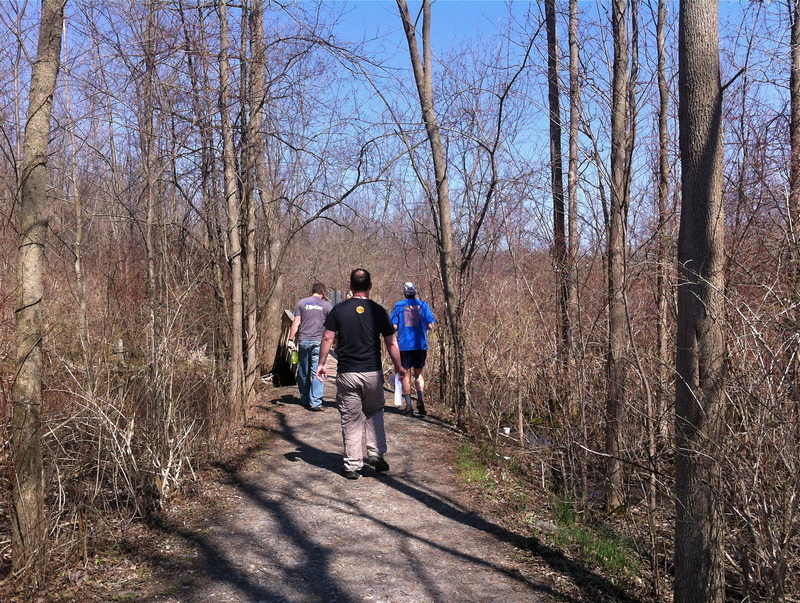 We decided not to do the hike through the snow to the maple trees, maybe next year. 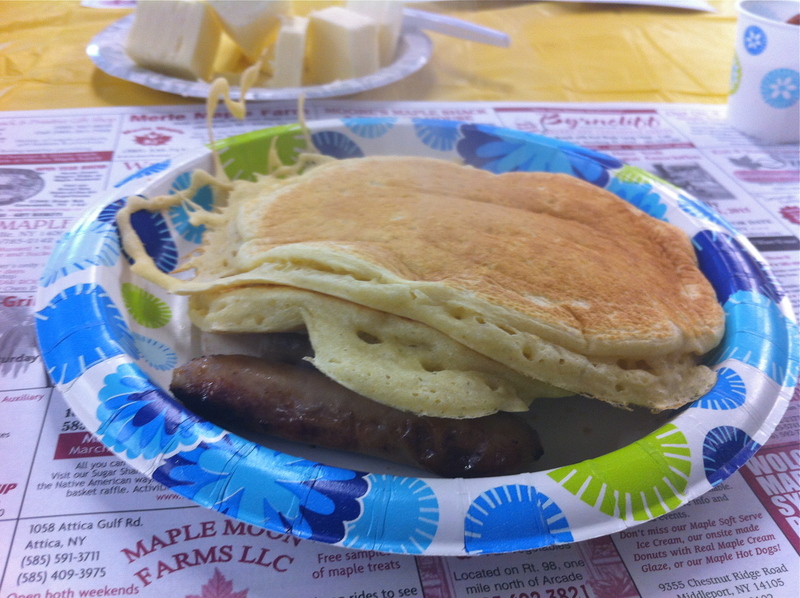 Do you like pancakes? 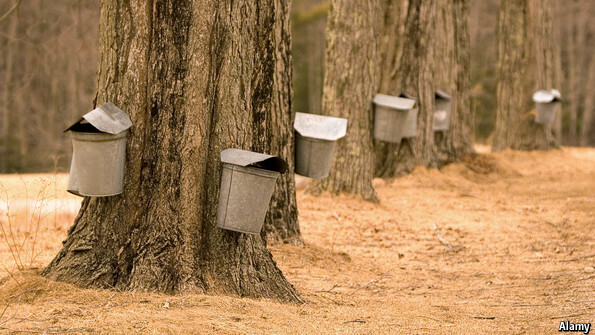 Do you dip them in syrup or pour the syrup over? 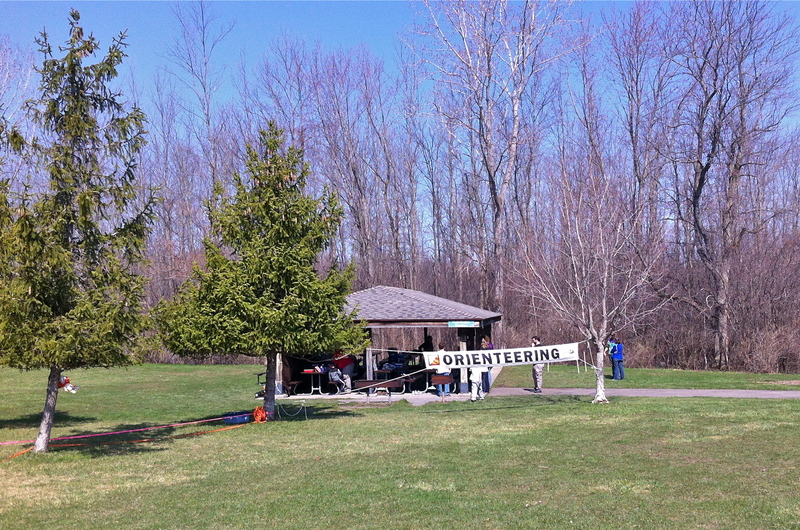 This past weekend we went to our first Rochester Orienteering Club http://roc.us.orienteering.org/ event at Black Creek Park in North Chili West of Rochester. 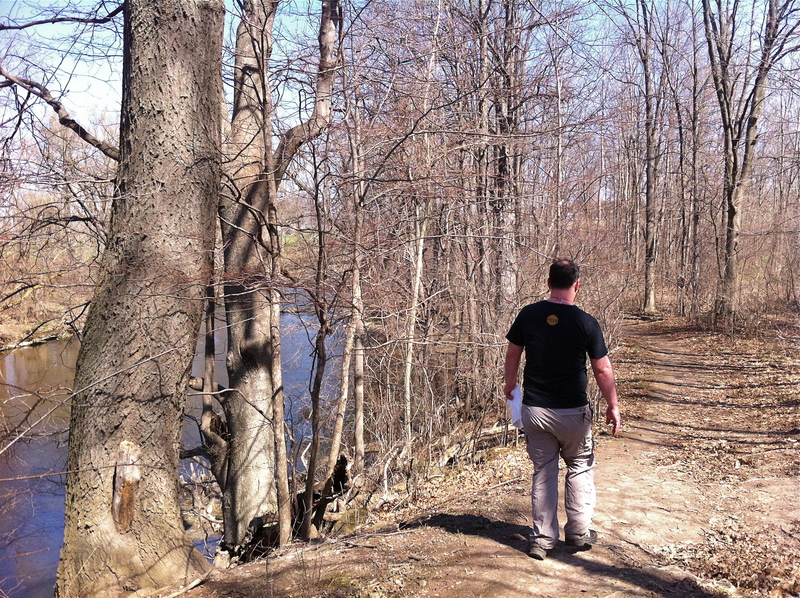 Luke and I thought it would be a good chance for us to explore the parks/trails where we live and get to know others who enjoy getting out in nature. In case you do not know what orienteering is think of a combination of cross country running and an adult scavenger hunt. All participants are given a topiary map of the park with course markers on it and a compass. 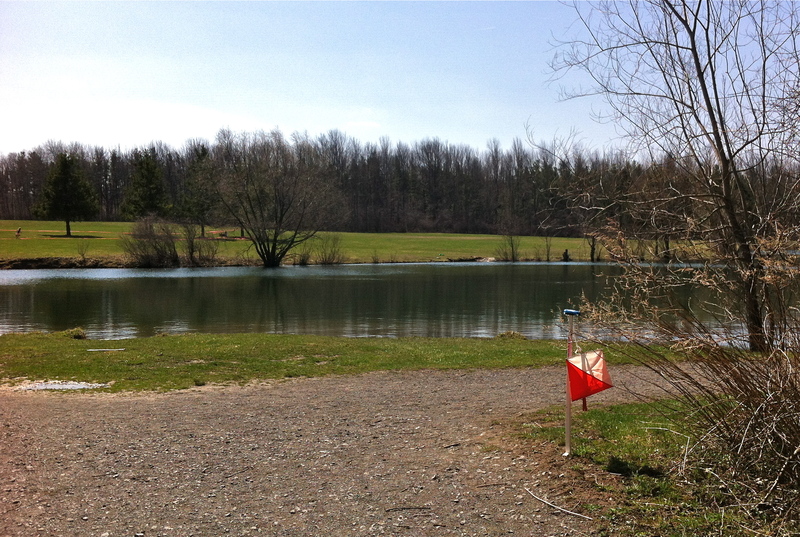 The goal is to find flag course markers then insert a GPS key to show you have oriented yourself to find that location. Along the way you have to make decisions about what terrain you want to cover to get to the next marker quickly. Competitive orienteers will run 6 miles of course trying to beat their best time with at least 20 flag markers from start to finish. We are far from prepared for that but arrived in time to do a beginner instruction and the white (easy) orienteering course. Luke was in charge of the map/compass and I had the GPS key. It was a beautiful day with a light breeze. The course took us about 30-40 minutes quickly walking about 1.5 miles with 10 markers. Because of the time of year, the toughest terrain decision we had to make was where to step to avoid being ankle deep in mud. Also finding flags was easier because the trees have not produced leaves yet. We learned on the way that we need to bring: sunglasses, hats, shoes that can get muddy, towels, and a change of shoes when we are done. Overall it was a great first time learning experience. Now we know we can do the yellow 3-4 mile course. 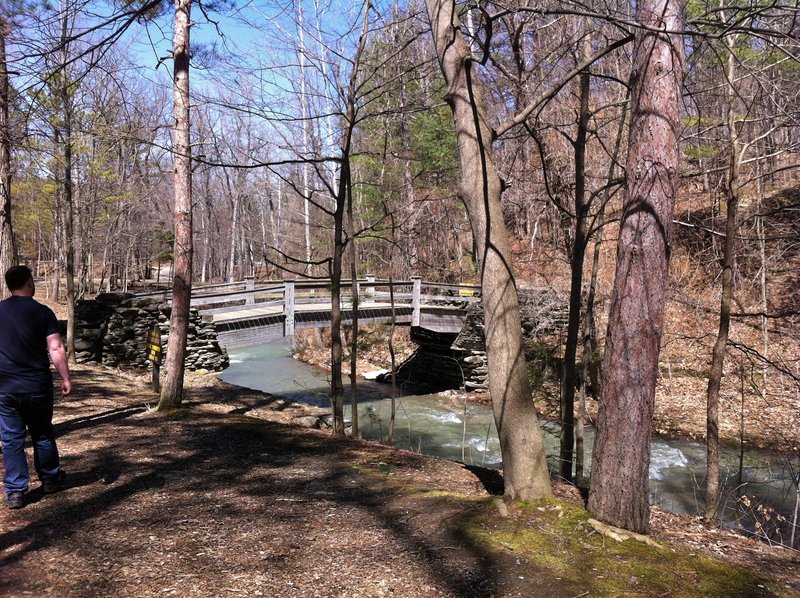 We enjoyed exploring a new park; Black Creek Park has many trails, great facilities, a children’s playground, open meadows, a pond, creek, and allows dogs on leashes. 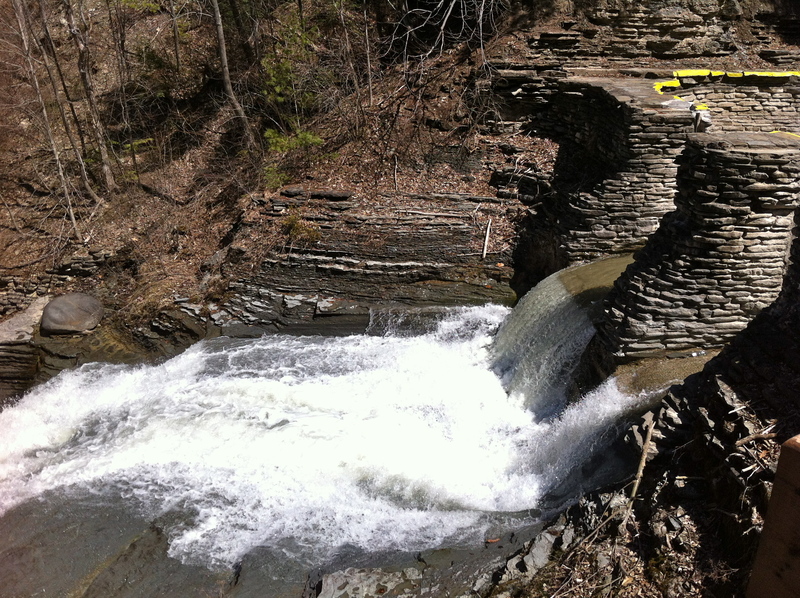 What are your favorite spring outdoor activities? Well it’s taken much longer than anyone wanted for us to get sunshine, but it’s finally here. It amazes me how it can be snowing Easter morning and the next weekend we are basking in 65 degree weather! 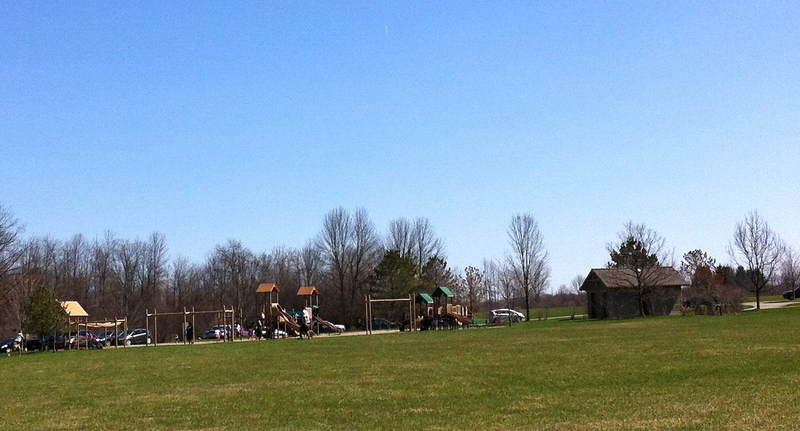 We took advantage of the perfect spring this past Sunday by driving to Dansville after church with the sunroof open. We grabbed some taco bell for lunch and watched a few planes take off at the airport. 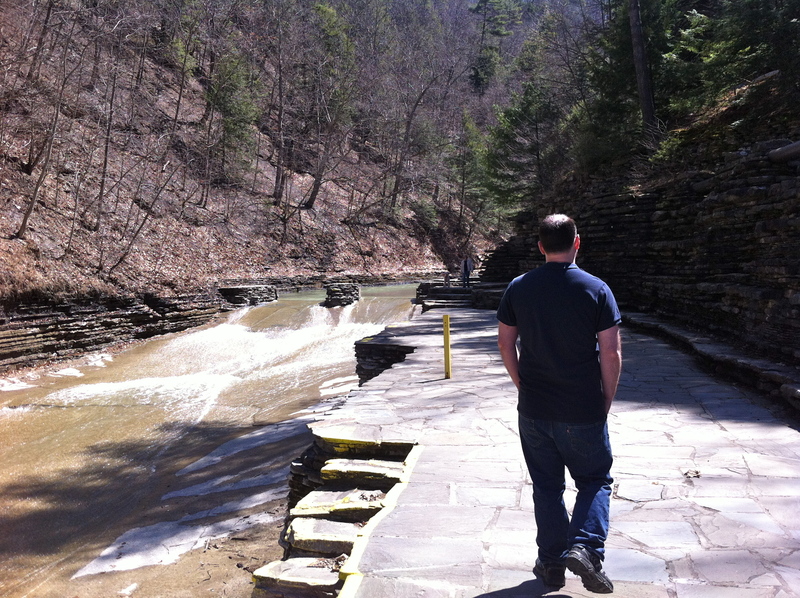 Then we drove over to Stony Brook Park, our closest state park which is only 10 minutes from our house for a picnic. The park has been closed since we moved out here. 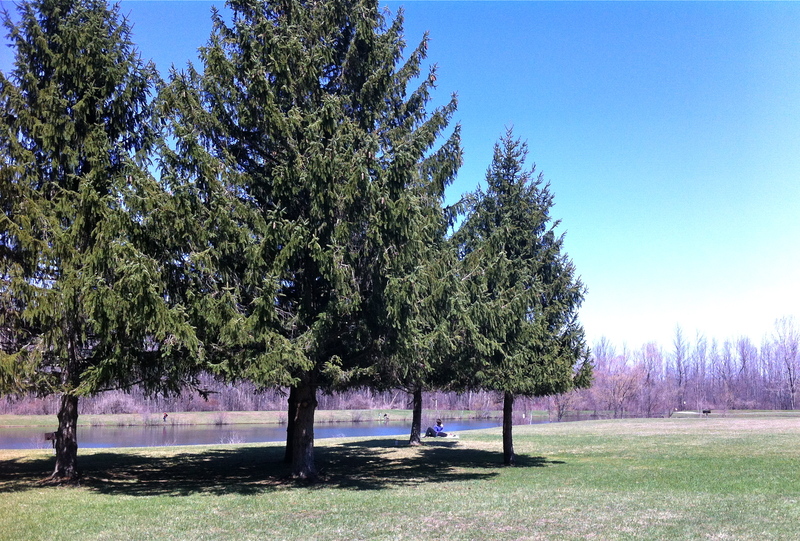 It’s still too early for the trails along the water, but the picnic area as well as the playground were well used by local families and their dogs enjoying the blue sky and first signs of green grass. We ate our fast-food picnic then wandered around. 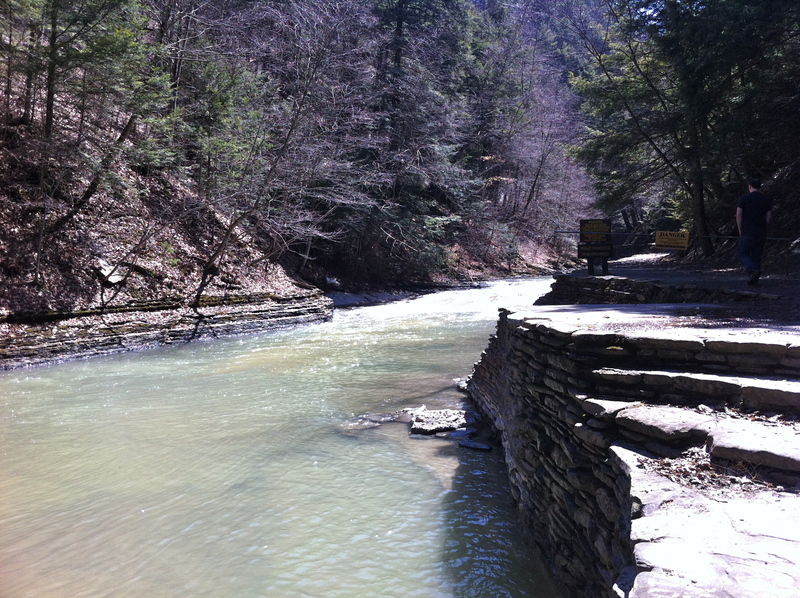 The park has tennis and basketball courts, a baseball diamond, and a summer-time natural swimming pool. We drove around then went to the southern entrance were there is a camp ground. This entrance was closed off so we moved on. We know we will return later in the year. Looks like a great place to get out in nature without a long drive and maybe take a family dog to walk around (more on the dog topic to come). What are your first favorite spring activities?